Early in the 2018 season, there were reports of a new eagle with Lady—and this eagle was also wearing a metal leg band. Once the band number was identified, AEF records show the new male had been brought to AEF in 2012 because he failed to fledge from his wild nest located in Marion County, TN. The eaglet was placed in AEF’s Douglas Lake hack tower and was released at approximately 14-16 weeks old. It is very significant that in this wild Bald Eagle nest, we have the complete history of both adult eagles! We do not know what happened to Sir Hatcher, Lady Independence’s first mate, but to continue honoring the memory and contributions of eagle conservationist Bob Hatcher, it was decided to call the new male Sir Hatcher II. Lady and Sir Hatcher II were observed bringing in sticks and nesting materials to their nest, but we couldn’t get a close look with the cams because the power wasn’t on. Because of this, we missed the egg laying! The best we can do to determine an approximate date for when they were laid is to count back 35 days from when they hatched. The egg that hatched on April 3, 2018 (SM14) had an approximate lay date of Feb. 27. The egg that hatched on April 4 (SM15), would have had an approximate lay date of Feb. 28, and the egg that hatched on April 6 (SM16) would have an approximate lay date of March 2. When we first got a good look inside the nest, there were already 3 perfect eggs being diligently cared for by both parents. Since we know when Sir Hatcher II was hatched, we believe that he was probably a first-time dad. And did he ever rise to the occasion! He was a great provider, keeping the nursery stocked with fresh fish, and he took turns with brooding the eggs. (Lady had already raised 13 eaglets with her first mate, Sir Hatcher I.) 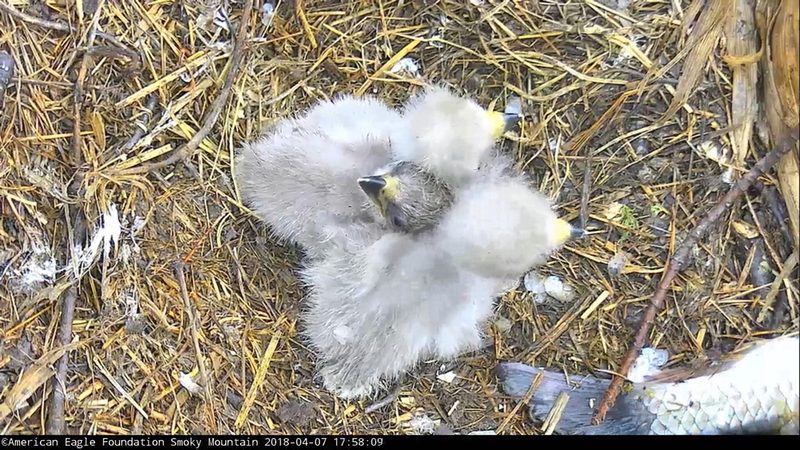 On April 3, two eggs had visible pips – and soon there were 2 little eaglets that captured our hearts, with another bobble-head making an appearance a few days later. 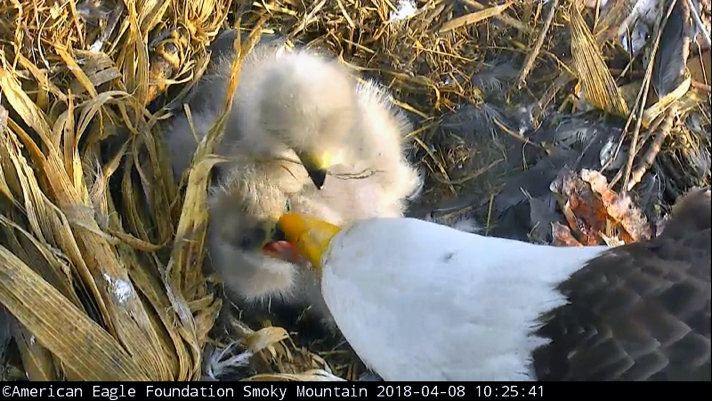 A slideshow/video by Cheryl Loheit gives us an up-close and personal look at the second week of life for these eaglets in their Smoky Mountain home. At four weeks of age, the 3 eaglets were doing splendidly! 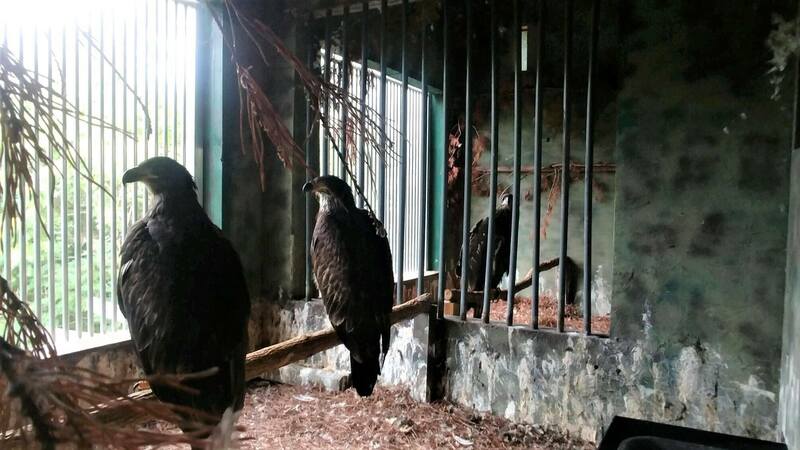 Food was plentiful, and the parents were caring for their eaglets with skill and devotion. However, during the evening of April 22, 2018 at approximately 5:55 pm, the AEF’s Smoky Mountain Nest Cam Volunteer Remote Camera Operator and Liaison identified what appeared to be some type of string in the nest. 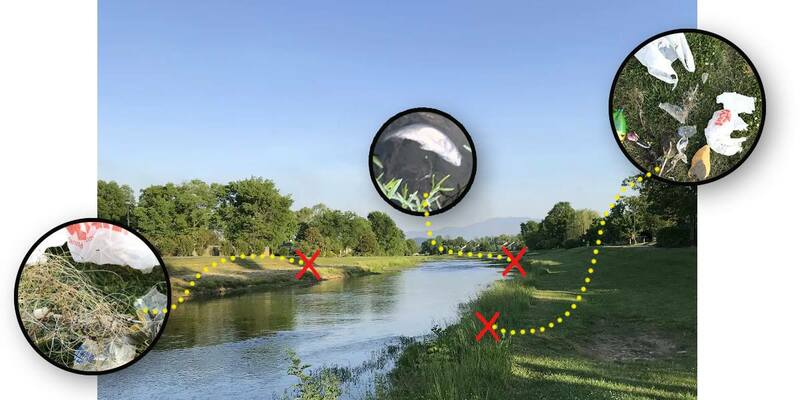 Upon closer observation by AEF staff and Smoky Mountain Nest Cam Volunteers, we concluded that a fish was brought to the nest with spinner bait & hook, and had braided line attached to it. 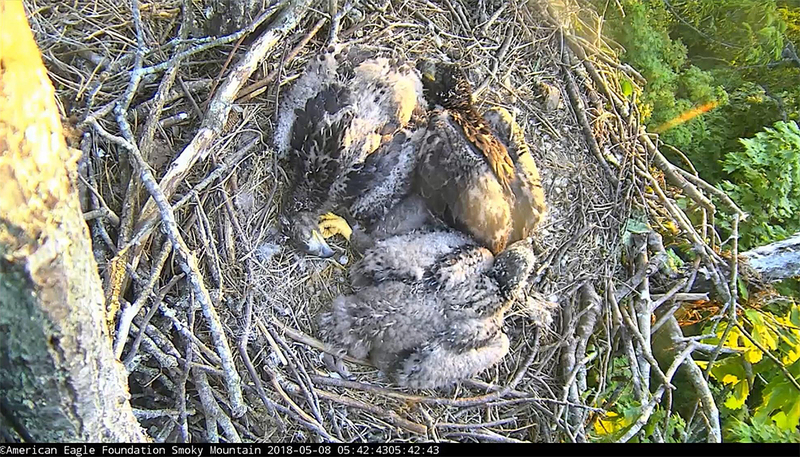 A Contest to Name the Nestlings began on May 8. Anyone could submit their favorite names for SM14, SM15, & SM16, and about 400 people participated in the contest. A short list was selected by AEF naming committee, and then AEF members were allowed to vote for the final names. Sandy Musso submitted the winning combination of Luna, Phoenix, & Nova. We all can think back to favorite times we remember during this season. Here are some special memories from some of our Mod Squad who constantly observed the nest. sharipf_AEF: Ha! Ha! My favorite memory is when Sir HatcherII was so exuberant in delivering food to the nest that he placed the fish on top of the smeaglets!!! The fish that bonked back! Pwhite_AEF: I fell in love with a Lady I, Sir II and the eaglets this year, watching them maneuver in such a small space. Watching the eaglets grow and develop distinct personalities. Feeling of relief, yet also sadness, when they were removed from the nest for their safety. My favorite memory though was being at the river in Pigeon Forge where the parents fished and seeing their actual environment. How close to civilization their nest is, how very small the river is. But I was able to sit on that river bank and visualize what their everyday life was like. That brought a reality to me that I haven’t had at other nests. They picked such a beautiful site to raise many families. And driving, I saw one of the parents soaring over the river. A surreal moment for sure! Little eaglets lining up for dinner. A pinwheel in the nest! Bird-Seer_AEF: It was a beautiful, sunny, slightly breezy day at the SM nest on 4/8/2018. The pantry was full and stocked with fish. Lady Independence had flown in and started feeding the eaglets. What was so touching about this photo was watching how tenderly she fed her eaglets. Lady Independence took a piece of the fish and patiently, gently, nudged the fish to the eaglet’s beak. To watch this powerful bird of prey be this sweet and gentle to her eaglets was what clenched my heart! Watching her powerful talons tucked underneath her, her powerful beak tearing up the fish into tiny manageable pieces so her eaglets could be well fed, and then gentle caressing them with her feathers as she protected them from the elements is a sight I will never forget and cherish. How amazing Lady Independence is! 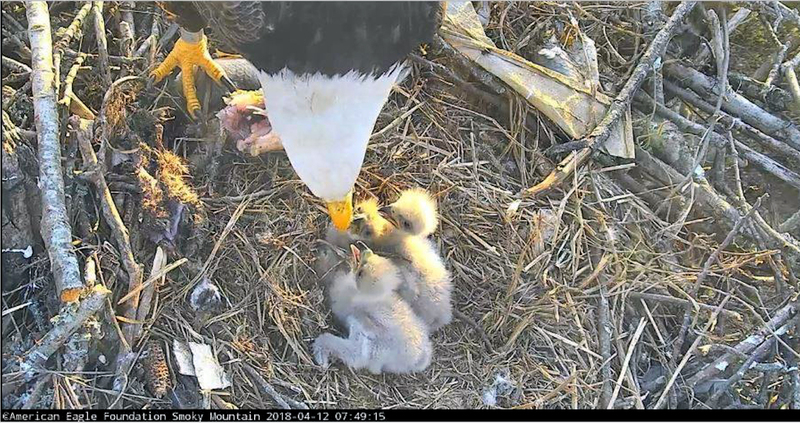 Lady Independence gently feeding baby eaglet. 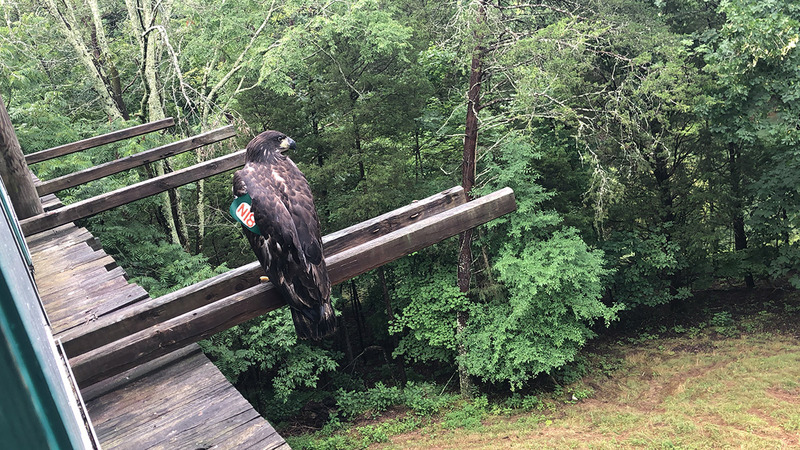 In order to keep them safe from fishing line, sinkers, and hooks that were constantly being brought into the nest, Luna, Phoenix, and Nova were removed from the nest and placed in AEF’s hack tower on Douglas Lake. 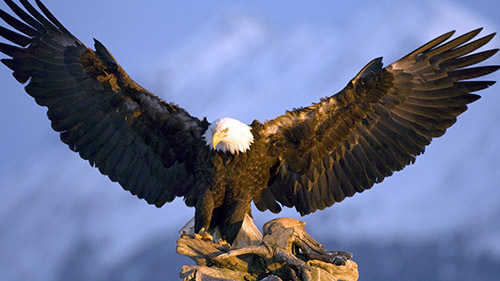 The events that continued to negatively impact the eagles in their Smoky Mountain nest clearly illustrate the dangers wildlife face due to the carelessness of humans. On May 21st, fishing hooks, lines, and tackle were once again brought into the nest. On May 22nd, all three eaglets were removed from the nest and placed in the AEF’s hacking tower located on Douglas Lake in order to ensure their safety until they could fledge. This was a joint decision by the AEF & the USF&W. 150 pounds of discarded fishing tackle and other debris was collected during the Little Pigeon River cleanup. One of the activities that drew a lot of support during Chatter Reunion 2018 was an opportunity to be involved in the Little Pigeon River cleanup. The stretch that was cleaned is the source of the main food supply for Bald Eagles Lady Independence & Sir Hatcher II. This project was designed to help keep eagles and other wildlife safe from fishing tackle and other debris left behind by careless humans. This project was jointly sponsored by the AEF and Keep Sevierville Beautiful. Volunteers came from all over – many Dollywood employees were there to help, as well as the Sevierville Fire Department with their boats, volunteers and staff from Keep Sevierville Beautiful, and staff and Chatters from AEF. All together, about 150 pounds of trash was removed from the area. The plans are for this to be an annual event, with signs and receptacles placed along the river bank encouraging people to be respectful of wildlife by disposing of their used or broken fishing gear appropriately. Nova, along with Phoenix and Luna, fledged from the Hack Tower on June 28, 2018. Phoenix – July 23, 2018 in Northern Michigan. 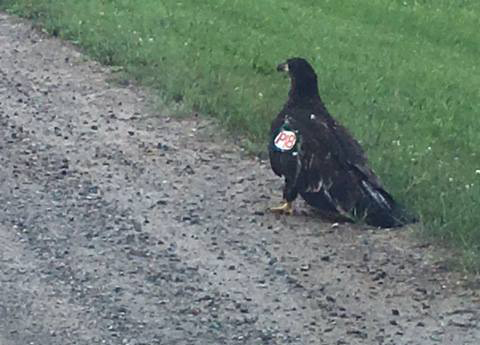 Eaglet Phoenix (wearing Patigial Tag P18) was spotted in Northern Michigan on 7/23/18, eating Raccoon on the side of the road. He was also seen flying to the safety of a tree. Phoenix was more than 750 miles from his fledge “nest” at the Douglas Lake hack tower. The photo was taken 3 ½ weeks after his 6/28/18 fledge, and 2 days shy of his 16 week hatch day of 4/4/18. We are so thankful to Shannon S. for the photo and for taking the time to find us! She said she continues to see a young Eagle in the area. We continue prayers for a successful life for Phoenix as well as Luna and Nova. AEF invites anyone to post photos and videos provided by our high definition cams. Since these photos can be copied and duplicated over and over, we request that when you post these up to Facebook, or another social media location, the following information be attached to each photo and each video somewhere in the description: © 2016 American Eagle Foundation, www.eagles.org. We appreciate your cooperation! There are so many people to thank in our Smoky Mountain Eagle Nest community. 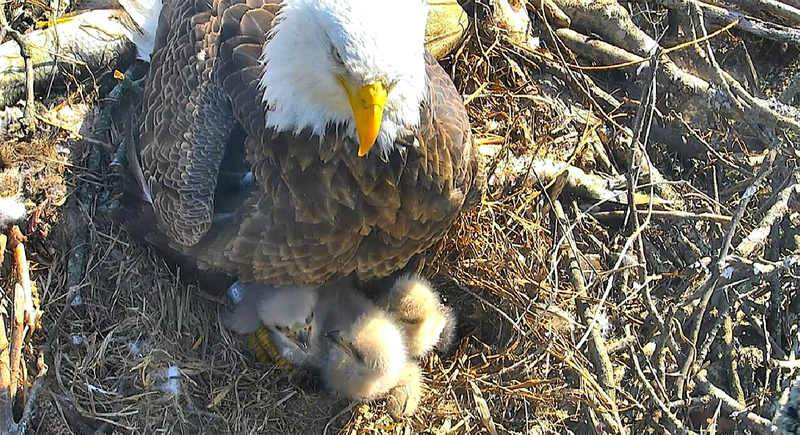 We could not do this without our Mods and Remote Cam Operators—our dedicated, talented, and professional representatives who welcome and educate hundreds of thousands of online viewers about this nest, eagles, and the environment. In addition, our videographers document important moments in the nest and give us memories to view over and over again. Our loyal viewers encourage and lift us up! The AEF appreciates your dedication and support—please know how vital you are to this program. In addition, Crystal Slusher & Debi Chernisky coordinate scheduling and stay on top of the entire mission, and Connor O’Brien keeps our cams rolling! We also thank PIKSEL, Chatroll, Spectrum, & Marks Electrical Services for their contributions.